Authentic barrel head sourced directly from California wineries. Individually handcrafted, one of a kind creation (not factory manufactured). Adorned with a laser engraved grapevine and personalized with your information. 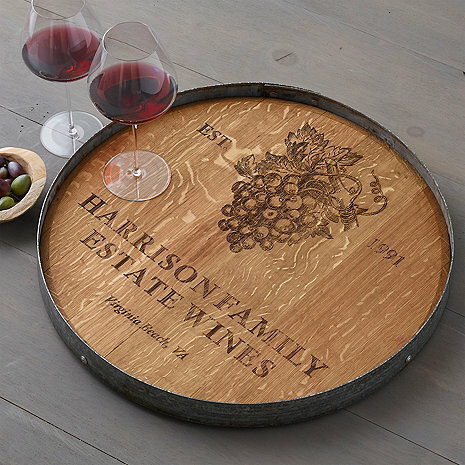 Taken direct from California Wine Country, this reclaimed barrel head includes a deep metal barrel hoop lip making its way around the full circumference. Adorned with a laser engraved grapevine and personalized with your information. Made in the USA. This lazy susan is exquisitely handmade. It is an individually handcrafted, one of a kind creation and not factory manufactured. It is therefore quite difficult to make identical items. Even though it is created by the most attentive artisans who put forth every effort to create only the best, there may be natural blemishes that should not be misconstrued as flaws. These are what make each piece of a handmade product charming and unique. The product images may not be identical to the product you receive. I want last three fields blank. What do I put to achieve this? I like the authenticity of the piece, but have 3 concerns: (1) the engraving is too shallow; it should be deeper. Simple scratches and day to day wear may impair the writings, (2) the top of the wood should be treated with a flat/low gloss protectant. The wood is untreated and easily stained; and (3) the lazy susan device on the bottom can be more robust; seems a bit fragile. The turntable ts GORGEOUS! But I have to tell about the customer experience: The turntable arrived with two mistakes one mine and the other was the maker's. No problem. They made another, at no cost to me, any got it to me by Christmas! WOW! We bought the Barrel head lazy susan for my husband's boss. We had it personalized with there name. They loved it! Love it! Looks better than I expected and turns effortlessly! very nice item.my daughter & future son inlaw loved it & how nice it looks. I am so pleased with my purchase. The wood is beautiful and worth every penny! I almost bought a similar product off amazon at a cheaper price but thankfully, I ran across a review that mentioned “plastic instead of wood”. This is a well-done WOODEN product that will likely become a family heirloom due to its personalization. This is a really pretty gift to give. Personal touch and they did a super job of getting this right out to us quickly. Bought one for a country style house but kept it for our more modern home. Works great.